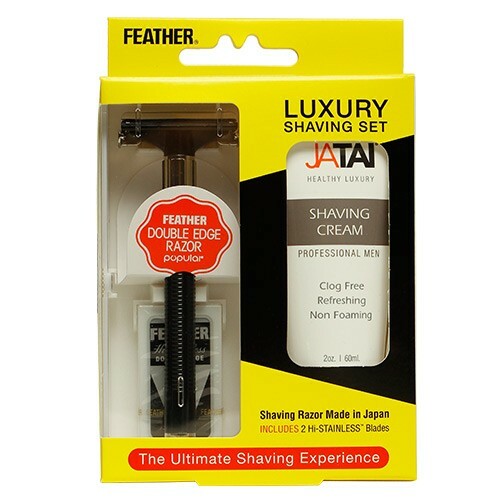 The Luxury Shaving Set includes the Feather Popular Double Edge Shaving Razor and Jatai Professional Shaving Cream. The Jatai Professional Shaving Cream is a part of our men’s facial grooming series inspired by traditional barbering to promote healthy skin and hair. There’s no blade buildup, it’s easy to rinse off, it saves time and extends the life of the blade. The shaving cream is great for thick coarse hair and it’s easy to outline beards and moustaches. Once you use Jatai’s Shaving Cream you will notice how soft and smooth your skin can really be!